Advertise your company and products every time you deliver! Australian Made Packaging produces timber wrap for large sawmill operations, wholesale timber merchants and retail timber outlets. 500mm 2400mm Up to 5 colours. 1/ Print on lighter colours such as white, yellow, light blue or green for high contrast. 2/ White with a 1 or 2 colour print is the most economical. 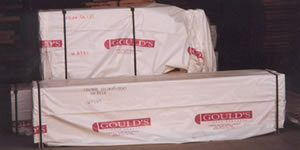 Australian Made Packaging sugests trialling 8 rolls of 3 different sizes of white polythene with a single colour print. We will change roll dimensions to meet your specific requirements.